POPULAR Online provides a simple and secure way to trade. Please register as a POPULAR Online user, to enjoy the full spectrum of our services. Registration is free! Once you have registered, our entire portal is at your disposal. Since POPULAR Online is available for online orders only, users are required to transact and pay online. We regret that we cannot accept orders made via customer service, tele-marketers, emails, fax or other non-online means. • DO I HAVE TO REGISTER FOR AN ACCOUNT BEFORE MAKING A PURCHASE? Please sign up as a registered user, to start shopping at POPULAR Online. • DO I HAVE TO PAY ANY REGISTRATION FEE, AS A USER? Register for FREE. A valid email is required for creating an account. 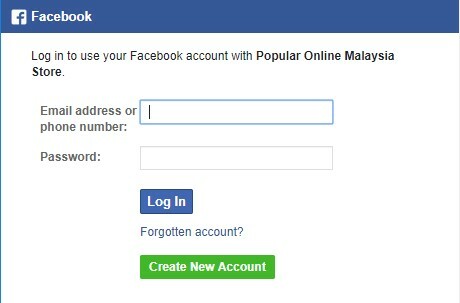 • HOW DO I REGISTER AS A POPULAR ONLINE USER? Click on the top right corner of the “Register” page. • HOW CAN I PURCHASE PRODUCTS? Step 3.2: Click "Shopping Cart"
Note 1: Click "Continue shopping" to return to the homepage and continue shopping. Note 2: To delete a product, click "X". 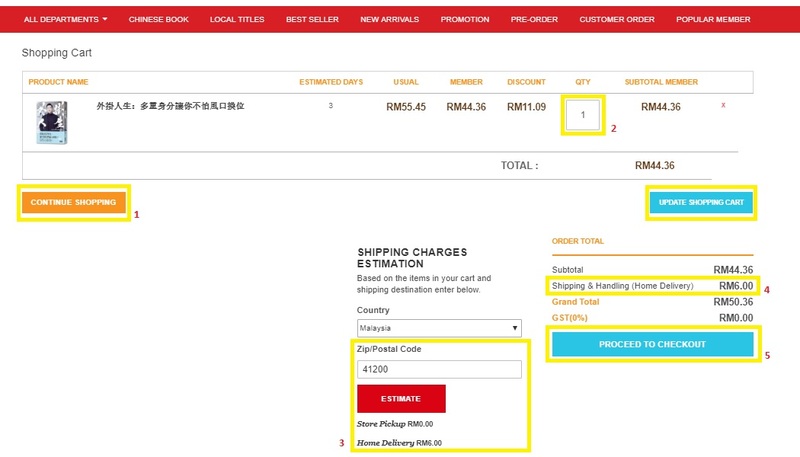 To change the purchase quantity, enter the number into the space and click "Update Shopping Cart"
* Please note your “order number”, to check on your order status at any time. Condition 2: Out of stock items will be displayed on the product information page [Order, immediately for your purchase]. * The final actual selling price of a pre-ordered or out of stock item may differ from its earlier pre-order price. The price will be based on the information displayed on the Checkout page. • ARE POPULAR ONLINE STORE AND POPULAR PHYSICAL STORE ITEMS’ SELLING PRICES THE SAME? POPULAR Online and POPULAR Physical Store items’ selling prices may differ. • CAN I PURCHASE AN ITEM AT A POPULAR STORE AT POPULAR ONLINE PRICE? Sorry; only POPULAR Online users enjoy our special online services and prices. • I ADDED A PRODUCT INTO MY SHOPPING CART YESTERDAY. WHEN I PROCEEDED TO PAY, THE ITEM PRICE WAS DIFFERENT. WHY? Item prices will vary, depending on different promotion periods, specific items and inventory changes. Please be mindful when proceeding to the payment page, by double-checking the price displayed, before placing your order. * Online users who have added items to their shopping cart will enjoy priority of subscription and the promotional price displayed. • WHAT ARE THE BENEFITS OF MY POPULAR MEMBER’S CARD AT POPULAR ONLINE MALAYSIA? You must register and become a POPULAR Online user, before being able to use your POPULAR Member’s Card to enjoy membership benefits. • I HAVE OBTAINED MY MEMBER’S CARD FROM A POPULAR STORE. CAN I USE IT AT POPULAR ONLINE? Yes. You can use your POPULAR card at the POPULAR Online website, as well as in over 150 public bookstores in Malaysia, Hong Kong and Singapore, including HARRIS and CD-RAMA in Malaysia. 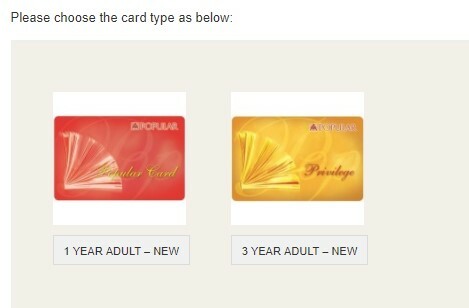 • CAN I USE MY SINGAPORE POPULAR MEMBER CARD AT POPULAR ONLINE? • WHAT ARE THE BENEFITS OF THE POPULAR MEMBER’S CARD AT POPULAR ONLINE MALAYSIA? • A 10%* storewide discount, except for promotion and nett price items. • A 20%* discount on POPULAR Choice, POPULAR Recommends Titles and selected members’ promotions. * All member prices are indicated on the item product pages, with the final discounted price indicated on the check-out page. Step 3: Select a region: “Malaysia” or "Singapore"
Step 4: Fill in your Member’s Card number and IC / Passport number and click "Submit"
• WHEN I WANT TO LINK MY CARD, WHY DOES THE SYSTEM SHOW "INVALID CARD DETAILS"? • MY MEMBER’S CARD IS GOING TO EXPIRE. CAN I RENEW IT ONLINE? Sorry, Singapore-based customers cannot renew their membership cards, online. But, if you want to do so, you may apply at the nearest popular outlet. • I AM A SINGAPORE MEMBER. CAN I APPLY FOR A MALAYSIA MEMBER’S CARD ONLINE? Sorry, Singapore customers cannot apply for a Malaysia member’s card online. If you wish to do so, please visit your nearest outlet. • CAN MY POPULAR MEMBER’S CARD BE LINKED TO A DIFFERENT ACCOUNT AT THE SAME TIME? No, a member’s card can only be linked to one account. • WHAT SHOULD I DO IF THE STATUS OF MY MEMBER’S CARD THAT I HAVE LINKED BEFORE HAS ALREADY EXPIRED? If your card has already expired, please visit your nearest POPULAR outlet to renew your member’s card, and re-link your renewed card. • WHAT PAYMENT METHODS ARE ACCEPTED AT POPULAR ONLINE? Malaysia-based users can pay via [Credit Car], [Debit Card] or [Online Payment]. Singapore-based users can pay via [Credit Card]. • CAN I USE ALL TYPES OF CREDIT CARD, FROM ANY BANK? POPULAR Online currently accepts VISA and MASTERCARD payment only. • HOW IS MY ORDER OR PAYMENT CURRENCY CALCULATED? POPULAR Online products and postage calculation are in Ringgit Malaysia. The payment total or refund is based on the current exchange rate, so please check with the respective credit card issuing bank. Each country has its import tariff provision. When the goods arrive in the country of import, that country will approve the tariff of the goods based on their category and value. The customs authority of each country reserves the right to conduct a random inspection and approve the tariff of the goods according to local regulations. We will declare dutiable goods in accordance with its actual price. Each country has the right to approve tariff and sales tax of the goods according to its import regulations. If the country carries out a sample inspection of the goods, the consumer will be responsible for incidental expenses incurred. If the recipient fails to collect the goods ordered, then he/she will be responsible for the loss resulting from related expenses, the destruction of the goods, or the return of the goods. Sorry, we do not have cash-on-delivery service for the time being. You need to pay online before we process your order. • IF MY ORDER HAS BEEN COMPLETED, CAN I CHANGE THE PAYMENT METHOD? Sorry, our system is currently unable to change the payment method. This is because each payment method uses a different operating system. But, if you still wish to change, please email the details to our customer service to cancel your order first. A re-order is then required. • WHEN I USE MY CREDIT CARD TO MAKE PAYMENT, WHY DOES IT SHOW "AUTHORIZED SUCCESS, THE ORDER IS NOT YET COMPLETED"? This issue is caused by the interrupted network or the window being closed while awaiting bank authorization and payment processing. This means, although the amount of the order has been authorized by the bank, POPULAR Online has yet to process your order or payment. What you need to do is, checkout again and complete the check-out process. Rest assured that this will not cause duplicate charges. • IN WHAT CIRCUMSTANCE CAN I REQUEST FOR A RETURN OF STOCK? • IN WHAT CIRCUMSTANCES ARE MY ITEMS/BOOKS NON-EXCHANGEABLE? To make an exchange, you need to notify us within 3 days upon receiving the items, and attach the damaged product, receipt or tax invoice along with order number. Our staff will perform the necessary verification and arrangements for the refund / return / exchange. Once we have confirmed that your item is returnable, we will inform you via email to make the exchange at a specified store. • WHEN I VISIT A POPULAR BOOKSTORE AND AM TOLD THAT THE SAME BOOK/ITEM IS AVAILABLE, CAN I JUST MAKE THE EXCHANGE THERE? Sorry, due to POPULAR Online and our physical stores having separate inventory systems, items ordered online cannot be exchanged with physical store items. • IN WHAT CIRCUMSTANCES CAN I REQUEST FOR A REFUND? • You have a valid reason to exchange, but we have no stock to meet your order. 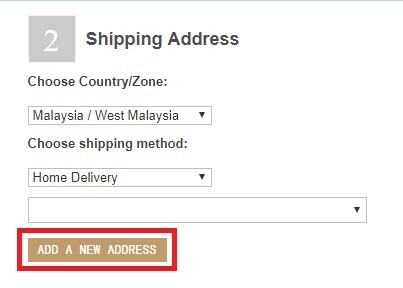 • The book that you order is unavailable, or POPULAR Online Malaysia or our Supplier is unable to meet your order; e.g. “out of print”. • WHAT ARE THE REFUND OPTIONS AVAILABLE? • CAN I ORDER A BOOK THAT IS NOT AVAILABLE AT POPULAR ONLINE? 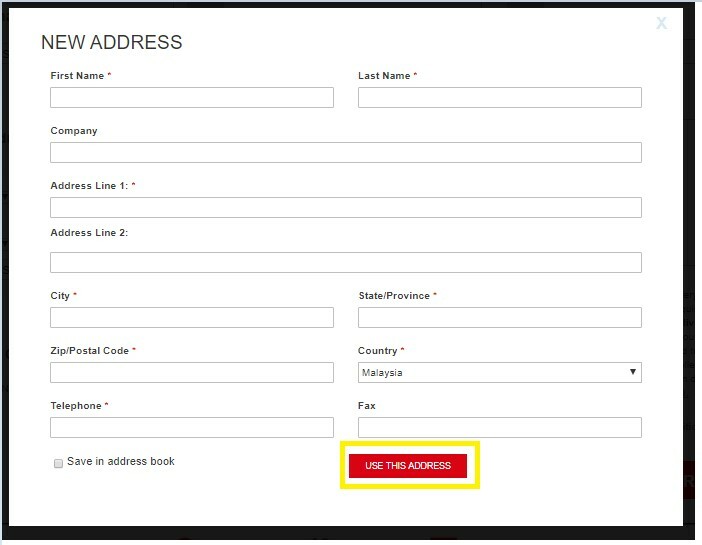 • WILL POPULAR ONLINE HELP ME TO ORDER IMMEDIATELY, ONCE I HAVE FILLED IN THE ORDER FORM? Not at once. When you have submitted your order form, within 1 week (7 working days) POPULAR Online will contact you again to confirm the product and order details. After confirming the details, POPULAR Online will takes 1-2 weeks to prepare the book’s URL and notify you to purchase and complete the payment. After completing the order, for [Special Order] items, POPULAR Online will place an order with the relevant vendor from the country of origin. Bear in mind that there is always the possibility of the item being out of print, or the vendor being unable to meet your order, resulting in your Sales Order having to be cancelled / refunded accordingly. • HOW LONG DO I NEED TO WAIT FOR OUT-OF-STOCK AND SPECIAL-ORDER ITEMS? Taiwan and Malaysia orders: 2-4 weeks. Hong Kong orders: 7-11 weeks. * Delivery time may also take longer, if it coincides with a National Public Holiday, festive season, or any unforeseeable circumstances beyond the company’s control.